Planning a meaningful, personal funeral is one of the most important tasks you will undertake. Think of the funeral as a gift to the person who is no longer with us. It is your chance to think about and express the value of the life that was lived. When personalized, the eulogy is perhaps the most memorable element of the funeral ceremony. A eulogy also greatly aids in the healing process. This article will help you choose the right person to give the eulogy as well as offer tips for writing and presenting it. It can also be called the remembrance. A eulogy is the speech or presentation during the funeral ceremony that talks about the life and character of the decedent. The eulogy acknowledges the unique life of the decedent. The eulogy typically lasts 15-20 minutes, although longer presentations may also be appropriate. The eulogy can be delivered by clergy, a family member or a friend. Instead of a traditional eulogy delivered by one person, you may choose to ask several people to speak and share their memories. There is also a growing trend toward having people attending the funeral stand up and share a memory. This works well, especially at smaller or less formal gatherings. Keep in mind that the eulogy doesn't have to be delivered by the person leading the service. Only if your clergy or someone else facilitating the ceremony knows your family well and can speak personally about the person who passed away is this appropriate. If the clergy didn't know the decedent personally, it's much more meaningful to have a family member or friend give the eulogy. You might ask several people to speak. If your family would feel comforted by a religious sermon during the ceremony, ask a clergyperson to give one. 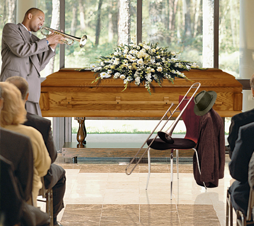 Just be sure to have someone else (or several people) deliver a personalized eulogy in addition to the sermon. If you must choose someone who didn't know the decedent well, make an effort to share with him / her meaningful memories that are important. Ask yourself, "What stands out to me about this person's life?" "What are some special memories I'd like to share?" "What were sometimes I felt particularly close to this person?" "What were some admirable qualities about this person?" We have already emphasized that the best eulogies are personal ones. They include loving memories of the person's life. It's nice when eulogies capture the decedent's personality. If the person who passed away was kind, the eulogy would give examples of this kindness. If the decedent had a good sense of humor, the eulogy might relate funny stories or expressions. The eulogy doesn't have to cover every aspect of their life. In fact, often the best eulogies are those that focus on the giver's personal thoughts and memories. Do try to acknowledge those who were closest to the decedent as well as important achievements in the person's life, but don't feel obligated to create an exhaustive biography. Keep in mind that the word eulogy comes from the Greek eulogia, meaning praise or blessing. This is the time to give thanks for a person's life and to honor his or her memory. This is not the time to bring up painful or difficult memories but to emphasize the good we can find in all people. Writing and delivering a eulogy is a loving, important gesture that merits your time and attention. Though the task may seem daunting right now, you'll find that once you start jotting down ideas, it will come together naturally. Afterwards, many who attend the funeral will thank you for your contribution, and your eulogy will be cherished always by family and friends. Be brave. The thought of writing a speech and presenting it in public makes many people anxious. Set aside your fears for now. Focus on your loved one and the gift you will be giving to all who knew and loved him / her. Think. Before you start writing, go for a long walk or drive and think about the decedent's life. This will help you collect your thoughts and focus on writing the eulogy. Look at photos. Flipping through photo albums may remind you of important qualities and memories of the person who passed away. Write a draft. Once you've brainstormed and collected memories, it's time to write the first draft. Go somewhere quiet and write it all in one sitting, start to finish. Don't try to get it perfect now-just get it down on paper. Polish. Read over your first draft. Look for awkward phrases or stiff wording. Improve the transitions from paragraph to paragraph or thought to thought. Find adjectives and verbs that really capture the essence of the decedent. Present your eulogy with love. Now you need to present your eulogy. If you are nervous, try to keep your focus on a family member or friend that you are comfortable with. If you break down as you're talking, that's OK. Everyone will understand. Just stop for a few seconds, collect yourself and continue.